The People's Democratic Party presidential candidate, Alhaji Atiku Abubakar, on Wednesday at a business summit in Lagos vowed to enrich his friends if elected president. "I am not going to enrich members of my family but my friends. "Are my friends not entitled to be enriched? As long as there is no element of corruption there," the former vice president said. A Eurasia Group report published on January 7 said that Atiku will enrich himself and his cronies if elected president and would also "pose the risk of a return to an even more rent-seeking governing style'"
The US Political risk consultancy group labelled Atiku a "gerontocrat who would focus on enriching himself and his cronies, avoiding the difficult and politically unpopular tasks necessary for reform." 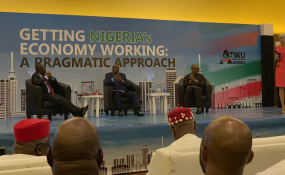 Atiku and his running mate Peter Obi were speaking to the business community in Lagos as part of their campaign for the February 2019 elections. Atiku, while discussing one of his key campaign points, the privatisation of the Nigerian National Petroleum Corporation (NNPC), vowed to carry out the privatisation even if there are threats to his life. "I am committed to privatizing NNPC, I said it. I swear. Even if they are going to kill me, I will do it. "At the end of the day, privatizing NNPC is going to be to our own advantage because you are not going to lose anything", the Atiku said. Atiku oversaw the privatization of hundreds of loss-making and underperforming public institutions when he was vice president under President Olusegun Obasanjo's tenure. "And there was none during our time, when we privatized the banks, when we privatized institutions of the private sector," Atiku said at the business summit. "I have not heard anybody coming to say either the president or myself, took money to do that. "So the intention of deregulating the economy and giving the private sector the responsibility of driving the economy, of course is to bring about prosperity to members of the public." In explaining part of his strategy to tackle corruption, at the event, themed "Getting Nigeria's Economy Working : A Pragmatic Approach", Atiku promised to implement an effective monitoring system to checkmate corrupt officials. "If you make it mandatory and compulsory for every public official who has to issue an approval, a license or anything to the private sector or anybody for that matter will lose his job, and you have an efficient monitoring system, you would have dealt a blow to corruption."